When it comes to ways to enjoy the leaf season that blankets Western North Carolina in vivid colors, the preferences are as boundless as the possibilities. 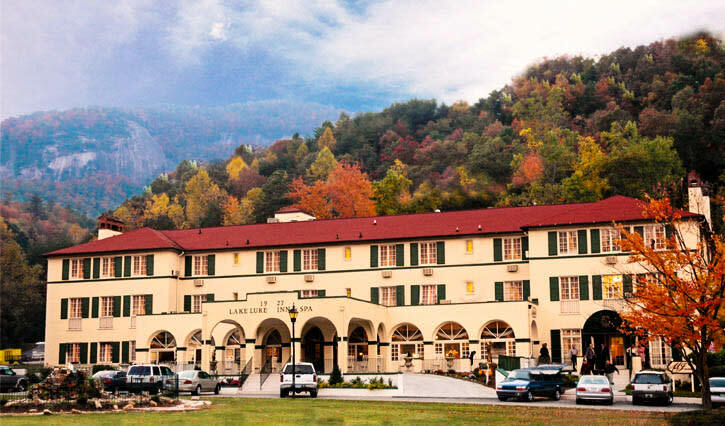 The vast expanse of forested terrain in Lake Lure and the Blue Ridge Foothills make it one of the best places in the Eastern United States to enjoy nature’s spectacular display of flaming golds, deep purples, and burnt red hues. With literally hundreds of tree species growing in the state, the Western North Carolina Mountains are rich in hardwood forests populated by trees known for their bright fall colors. To truly relish the autumn leaf color, follow the lead of the many photographers and leaf-peepers who flock to the area during this time of year; park the car and go exploring. Be prepared to engage all of your senses in the beauty that is reflected by Autumn in the Blue Ridge Mountains. Enjoy the road, but be sure to experience the hometown flavor of our lovely small towns or take in a bike ride or hike in one of our many parks. Don’t be alarmed if you feel mesmerized. It has the same effect on locals, too. 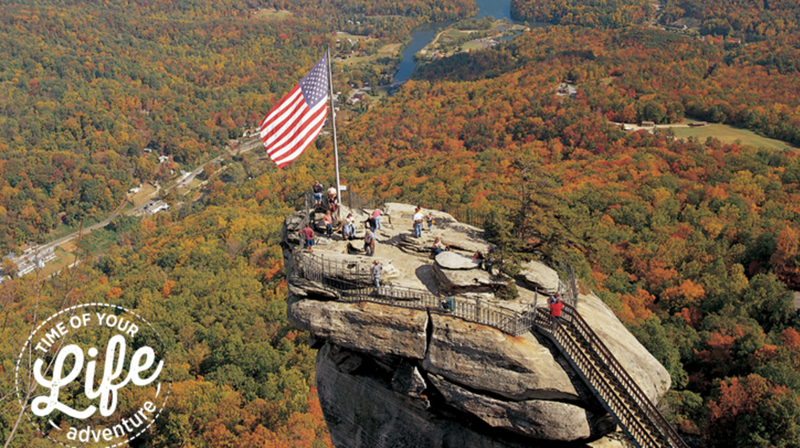 Start at the top, literally, and take in a 75-mile panoramic view of fall color from the pinnacle of Chimney Rock State Park. If you bring your mountain bike, check out Buffalo Creek Park and get two benefits in one – a mountain experience that will challenge your fitness and offer great fall views with a varied terrain. If you bring your four-legged children, they’ll have a ball at Dittmer-Watts Natural Trail Park in Lake Lure. This park is also a great place to have a private picnic surrounded by pretty fall leaves. As if the show-stopping foliage isn’t enough, an array of fall festivals, great music, and irresistible foods fill the fall calendar; the result is an opportunity to make great fall memories with family and friends. 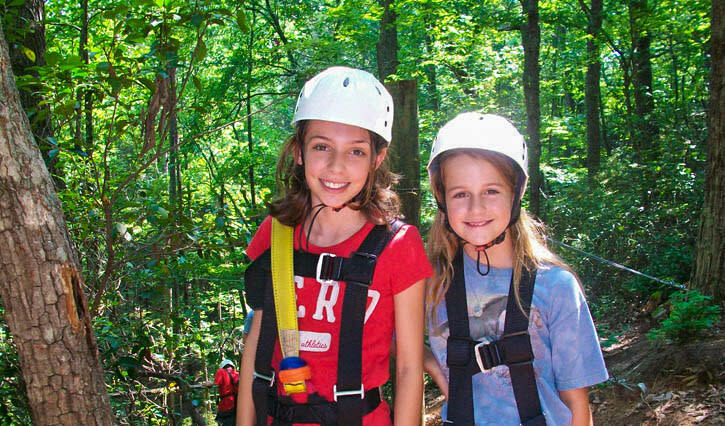 Our local zip line tours are perfect for both families and thrill seekers alike. Soar through color-soaked canopies, across gorges, hillsides, and water as you tour over several acres of stunning hardwoods. Whether you see the fall color by way of a scenic driving tour or by wrapping your mind around a blanket of leaves along a woodland trail, we have several drives to explore. An afternoon drive through our history-laden main streets, and scenic back roads will offer incomparable vistas, revered history, local treasures and of course our authentic hospitality. Discover historic sites, rustic barns, log cabins, and businesses that make up the vibrant fabric of our county. Click here to see all of the scenic tours including maps with driving directions. Be sure to view some of our favorite spots for fall color on Facebook or Instagram and share your fall color memories with us by tagging #TOYLfall.